Old Home in 1925 emerged out of plans for an Old Boy Reunion. When word came that city status would be granted around the same time, the celebration planned became more elaborate and over a period of several months was transformed from an Old Boy Reunion to an Old Home Week. The town of North Bay was involved in the organization and provided funds for the celebration. The work, however, was done by the many OHW committees which oversaw every aspect of the operation. 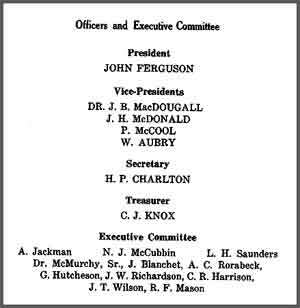 The overall organization was in the hands of the Executive which consisted of a President, four vice-presidents, a secretary, treasurer and an executive committee of eleven persons. They were all male. 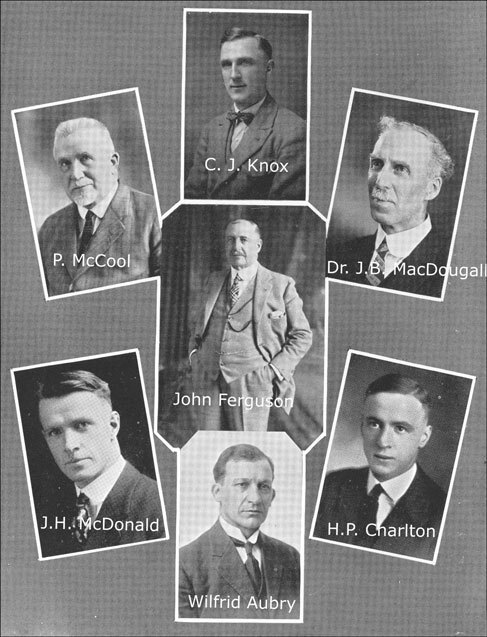 The president was John Ferguson, the “founder” of North Bay. Dr. J.B. MacDougall, who was probably the author of much of the souvenir book, is well known as the first principal of the North Bay high school. He was later appointed superintendant of schools for a vast area of the north and has left a fascinating account of his work called, Building the North. The other members were also prominent members of North Bay’s business and professional community including J.W. Richardson, who was mayor for several years and the founder the Richardson hardware store. A.C. Rorabeck was the first pharmacist and he also ran the Bell exchange. More information on some of these men is available in Anson Gard’s study of North Bay, The Gateway to Silverland. As well as the executive there were numerous working committees (see below) which supervised all aspects of the organization from sending invitations to the Old Timers to arranging billeting for them and well as all aspects of the program. A list of all the committees follows. Most of the members of these committes were well known members of the English elite of North Bay. Several of them had been or would become mayors or were on city council at some point in this period. 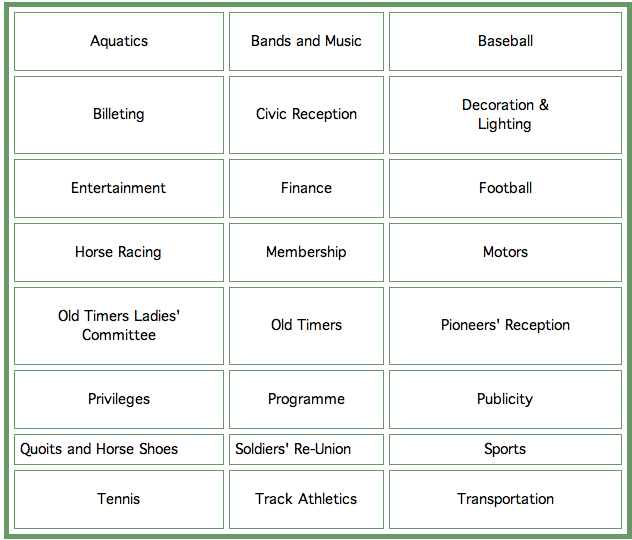 Women were placed only on a few committees, particularly those dealing with the Old Timers. The wife of Harry Marceau (who was the local M.L.A. in 1935) sat on the the Ladies’ Old Timers Committee; she was one of the few French Canadians involved. The complete list is available here as a pdf. Articles in the Nugget on the organization of OHW in 1925 are listed and summarized in the attached pdf file. This entry was posted in Celebrations, Community History and tagged North Bay, Old Home Week, The Nugget on January 25, 2013 by Françoise Noël.